Each scoring arm measures 40 cm. The spikes each measure 17cm. The hoops measure approximately 13cm in diameter. 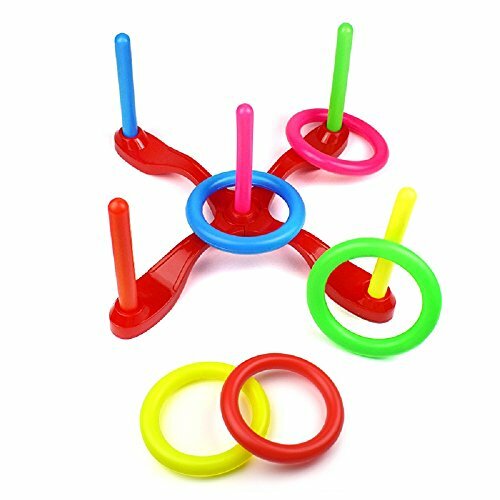 Upgraded Material of plastic ring toss games, more solid with new structure. Funny games,improve hand-eye coordination also improve intimate between friends and family. Easy installation, convenient carry indoor or outdoor, suitable for party,camping picnic activities. 5 poles and rings,players don't need wait by turns, good group games and competition games. High quality with reasonable price but with the endless funny, we guarantee a worthy purchase. If you have any questions about this product by Pemalin, contact us by completing and submitting the form below. If you are looking for a specif part number, please include it with your message.